You may have noticed that we ran a campaign calling for support regarding the Groupon trademark issue. Fortunately, everything was over much quicker than everybody expected. It is fair to say that we were surprised by our campaign and the amount of support we had. And so were they (GroupOn). As Bradley said, the campaign could have failed miserably. It was a pure gamble. And I was everything but excited and full of expectations when we launched the campaign. We didn’t know how it would go and our preparation was.. simple, at best. I don’t mean to discredit any of the great work the volunteers around us (and we, ourselves) did. But it’s true that we’re not experts and that we didn’t have all the things in place you could have expected us to have. For example, we didn’t really have a bar of the money raised on the web page. In fact, that information was only available to a limited extent. It’s mainly my fault, but I also blame the fact that we only had mockups of the page, and not real code just until hours before the launch. Personally, my thinking was that we’d have days, if not weeks, to slowly fix things up. Fortunately, things went differently. The coverage was amazing. I didn’t expect that our very simple page generated so much traffic. It’s hard to come up with an exact timeline of events as everything happened quickly and, in fairness, a bit chaotically. It may have been OMGUbuntu or Reddit who have reported first on our fundraiser. 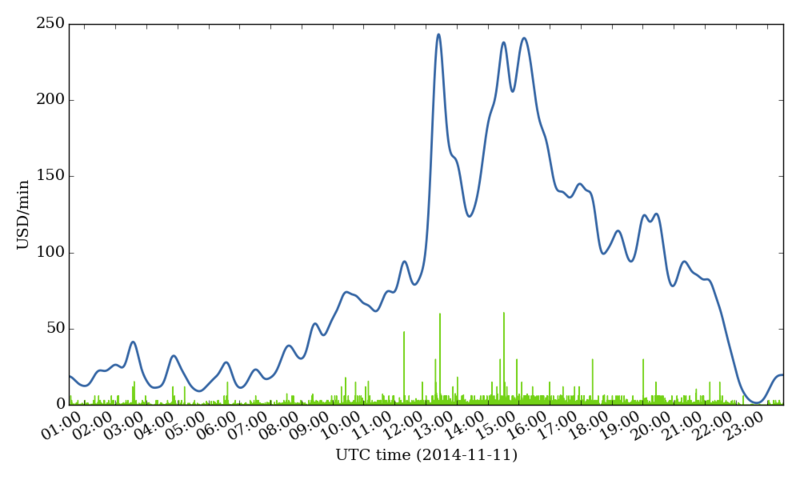 Other sites, such as Phoronix or Hackernews followed quickly. I was told that the latter was exceptional, because it ranked very high for rather long time. By quickly checking Google News, I know I haven’t found all the articles on the subject, but so far I’ve only found this article which was not in favour of our move. I think this was surprising to most, if not all of us. Over the course of the day, this image was floating around, showing Brian’s LinkedIn profile which some people found hilarious. Some other pictures were floating around and comments were made. Some of them not in a not acceptable language but most of them were just expressing their concerns regarding Groupon’s behaviour. Some people cancelled all their accounts with Groupon while others started a petition. We had close to one retweet per second and money was pouring in. The average amount donated was about 20 USD and the rate at which people donated was about 75 USD per minute. Every single minute. This can indeed be considered success. I think I noticed that this is going to be big when Freenode sent a message to all its 80000 connected users asking for supporting our case. “This is bigger than GNOME“, they said. Very correctly so. And it’s a shame, too. Not only for Groupon, because they needed to use the emergency break here, but for the system at large. It shouldn’t be the case that you need money in order to defend yourself against someone misusing your name. Dear Internet, thanks. I am overwhelmed. We did not expect that amount of feedback to our recent trademark campaign, let alone the financial contributions. Our campaign was very successful. It was too successful, at least from a technical point of view. We are using a self made, very rudimentary Makefile for the business logic. We are still busy verifying the incoming transactions with Paypal… During the campaign, our servers were very busy handling the incoming requests. I didn’t expect Groupon to be that cooperative given the behaviour I have observed over the last few months. It might have been Engagdet which were the first to report that Groupon backed up. Other news sites followed suit. All of that happened so quickly, that some news sites couldn’t even report on the case and could only report on Groupon abandoning their marks. That was probably Groupon’s strategy and, I guess, it was a wise choice. They retired their marks, but the app and their page are still online. They also still have a Gnome job posted. But I have no doubt that this will cease to exist. Again: Thanks to everyone involved. This could as well have been the end to the GNOME Foundation, given that defending the GNOME marks is one of their main reasons for existing. A special thanks to all of you who have spread the word and made this campaign successful. Let’s hope we do not need such a campaign in the future. For those of you who are interested in some pretty graphs (thanks benzo! 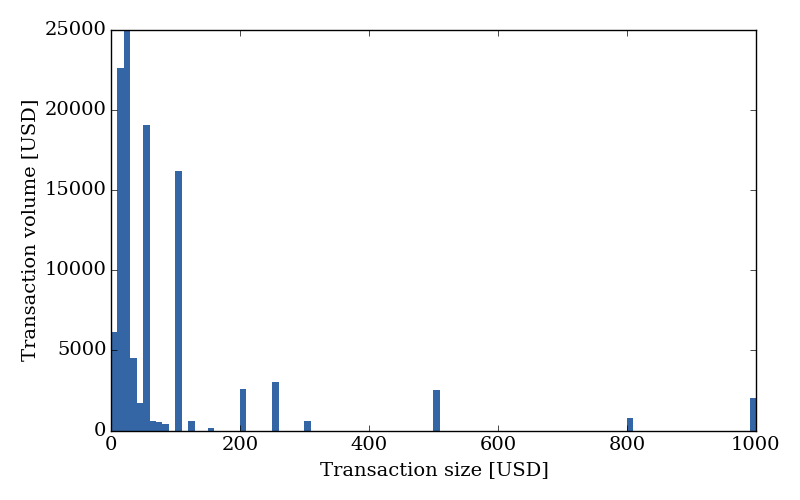 ), here is another one showing the transaction sizes and their volume. You can see, that we had many many small contributions. This is so amazing. I am very grateful and happy to see our community standing together so closely. I personally think that Google+ helped spread the word a lot. That day almost everyone from the FLOSS community was talking about it under the #DefendGNOME hashtag. Nobody cares about Google+ Alfredo. Thank you, and congrats on the successful campaign! The phrase is to follow “suit” like in a game of cards. You might have spent too much time working on a suite of office software, or a suite of nice furniture, but that is a different phrase.